Have you ever flipped through a cook book and just wanted to make EVERY single recipe in the book it’s just that good? This happened to me the other day. 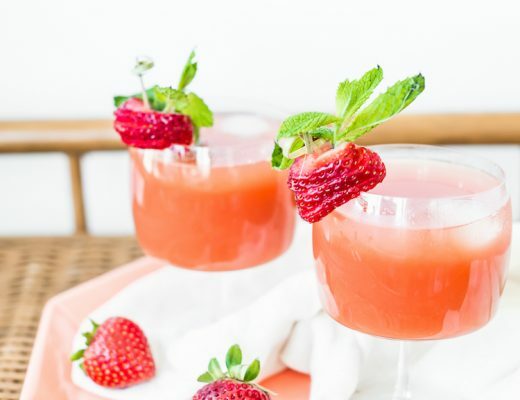 It doesn’t hurt that all the mouth watering recipes have booze in them, even the food! Uuuuh huh, this is a magical book, ya’ll! 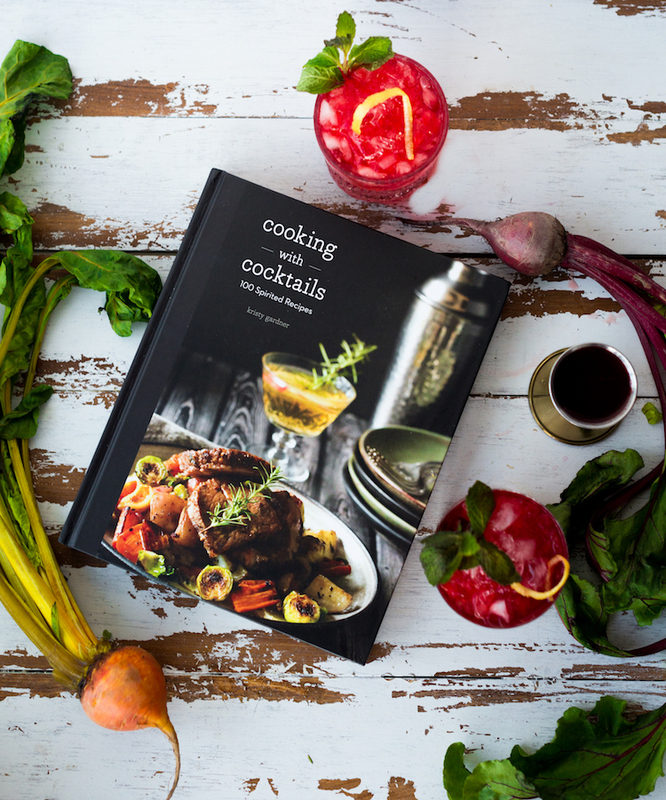 My friend Kristy Gardner, recipe developer + blogger extraordinaire behind She Eats, recently came out with this magical book aka Cooking With Cocktails. She calls her self the Bourbonator so it’s no surprise she has a booze filled cook book. Also no surprise why I love her so much. 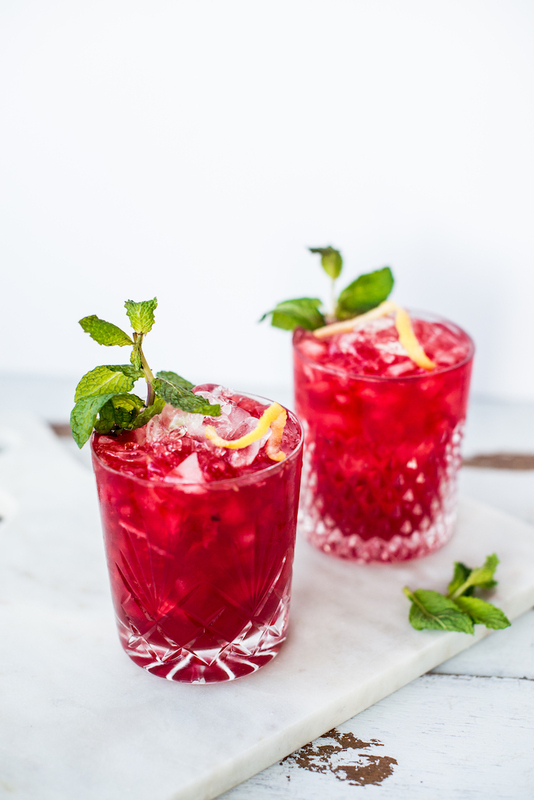 Flipping through the book for the first time, one recipe stood out to me immediately: the Boozy Beet Shrub cocktail! 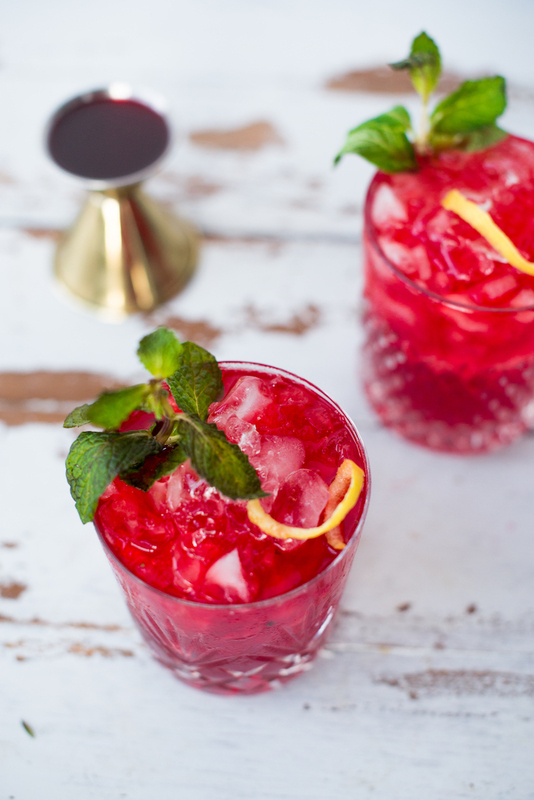 Coming across the recipe, the color drew me in it was so striking, I mean looks at it! It was a bit out of my comfort zone; I don’t tend to eat beets let alone drink them. I mean my phone tries to autocorrect beets to beer if that’s any indication of how often I eat beets, ha. 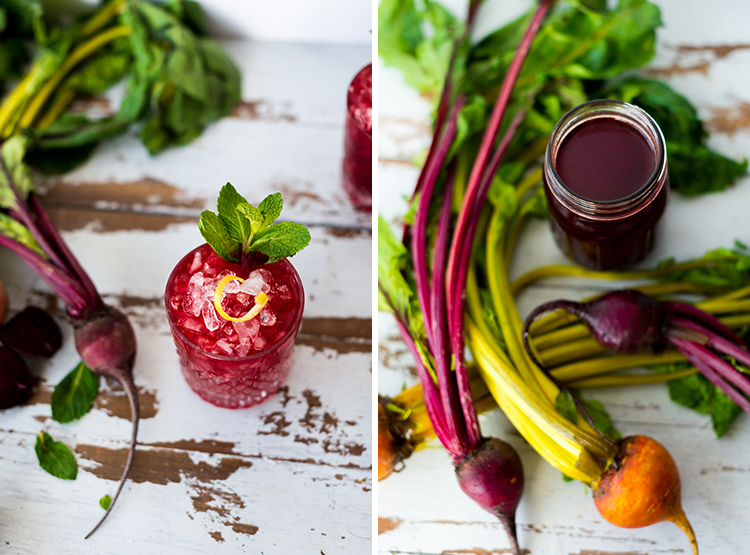 I decide to take a step outside of that comfort zone + take a journey to beet town. Look at me go mom! Now before you say beets are amazing + that I am weird, I have a negative association from a childhood trauma, like being made to eat canned beets before the age of 5 before I could leave the dinner table kinda trauma, thanks grandma. 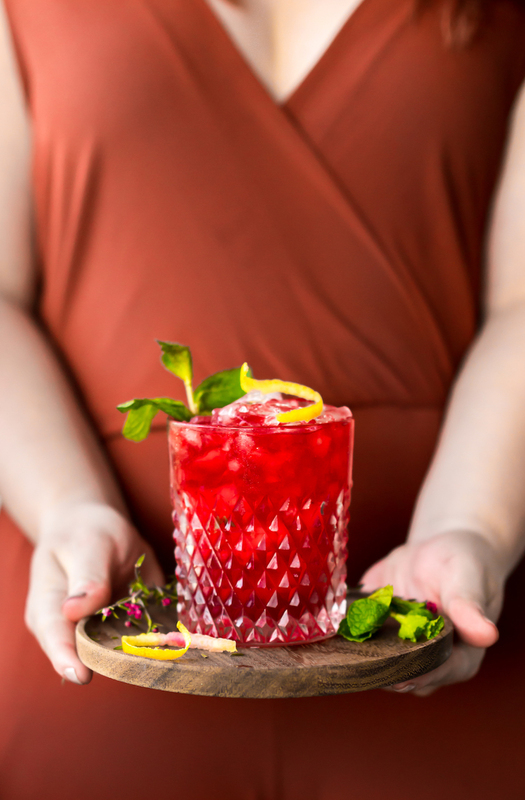 Kristy’s cocktail calls for first making a beet shrub with mint + paprika (such a unique combo!) + then adding it to gin, lemon + tonic. It’s a refreshing cocktail that’s a bit savory, sweet, with the quintessential earthiness from the beets. I think the earthiness is what throws me off really with beets. 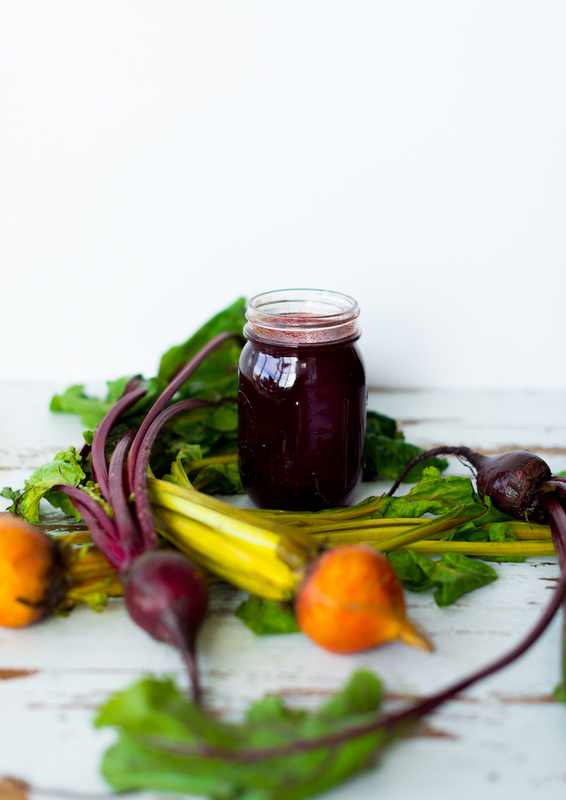 It’s just not my jam (sorry not sorry for the beet jokes!) One thing I discovered though is I like golden beets. 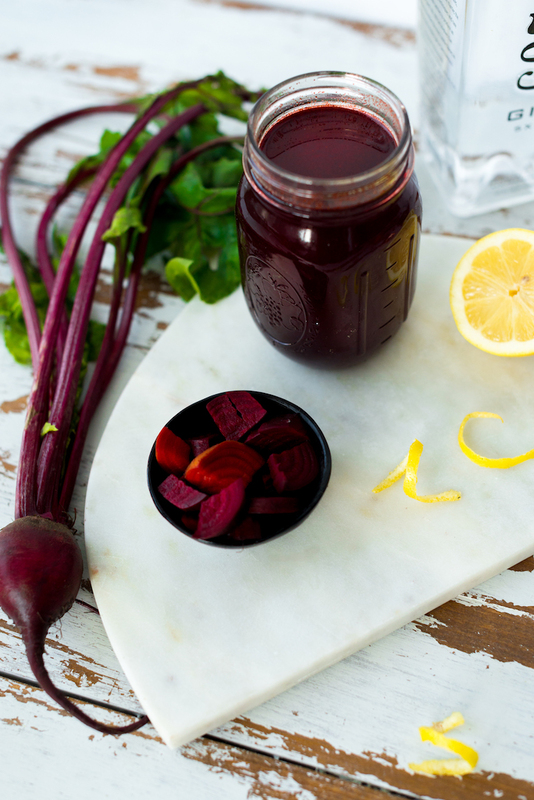 They have s bit more of a sweet flavor without the overwhelming earth flavor red beets impart. So in the original recipe, Kristy calls for all red beets, but I replaced some with golden beets. The color hardly changed, but the flavor was more palatable for me. 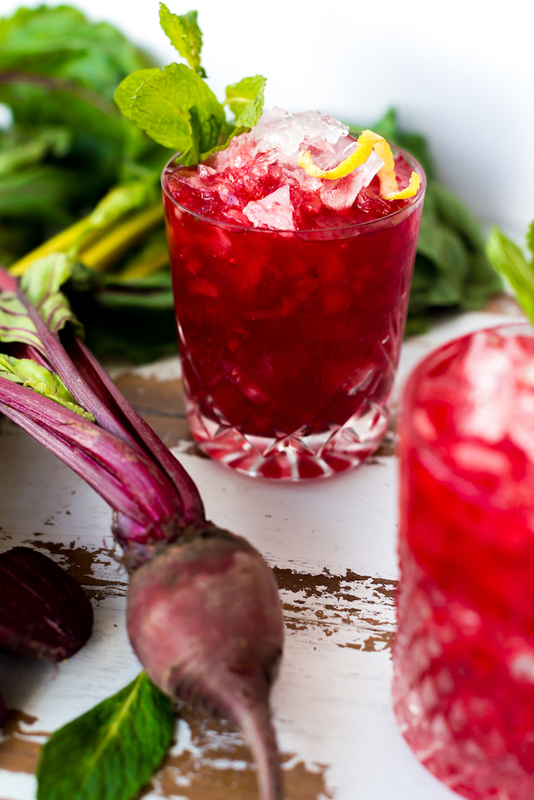 Feel feee to use all red beets though if you are a fan for the boozy beet shrub cocktail. The book is divided into chapters starting with the first course, cocktails of course, followed by appetizers, main dishes, and desserts. 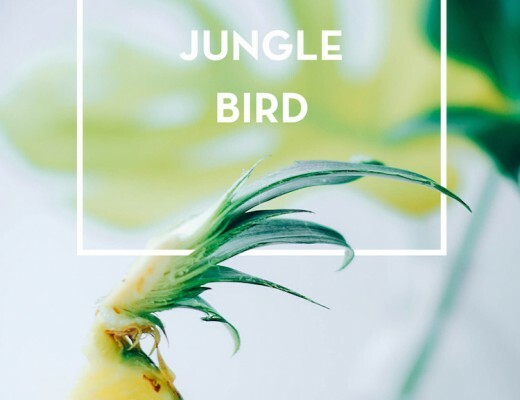 Each recipe would be delicious on their own, but the addition of the spirits adds depth, flavor + in some cases where it’s not cooked out, it adds some buzz in your step! The photos are bright, but moody which I love. I am a sucker for cocktail/cookbooks with good photos. In fact, I almost exclusively buy ones with pretty photos! 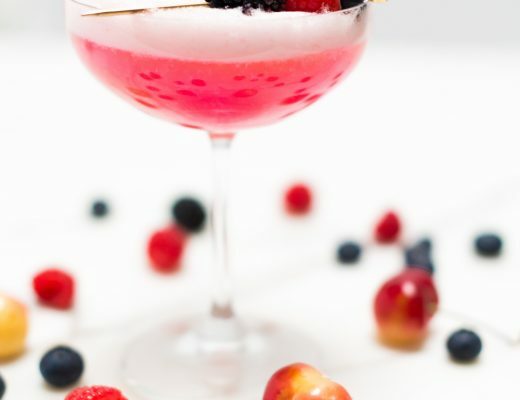 It’s the same on Pinterest for me, if there is a pretty photo of food or a cocktail, it makes me want to try it all the more. Guilty! 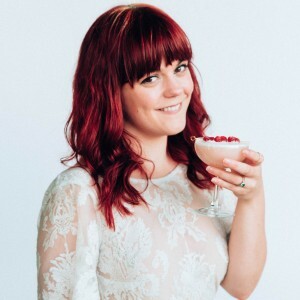 Kristy focuses on in season + super local ingredients for all her recipes. This is my MO for all of my cocktails, aside from the occasional exotic ingredient (dragon fruit for example) so I greatly appreciate this aspect of her approach. It not only makes a big difference for the recipe’s flavor, but for the environment. Kristy has whit, humor + a bit of a sailor mouth + I love that this personality comes through clearly in her writing. I have yet to meet Kristy in real life, but I can tell we are spirit animals. Recipe adapted from Cooking With Cocktails, get your copy here! 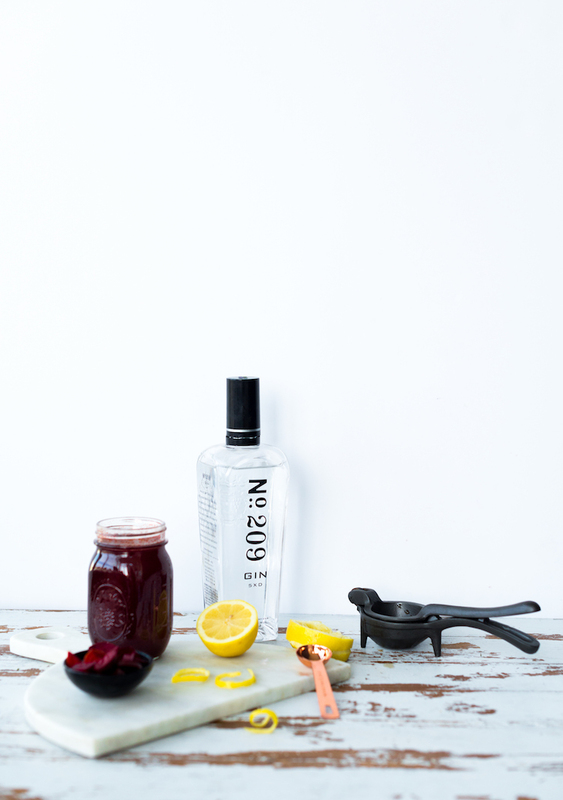 Pour the lemon juice, beet shrub, and gin into a mixing glass with ice. Stir to chill for 20 seconds. Fill a rocks glass with crushed ice. Strain the liquid into the glass. Top with tonic water and stir. Garnish with sprig of mint. Enjoy! Place the vinegar, sugar, mint and smoked paprika in a non-reactive bowl. Whisk well to combine. Add the beets. Mix well and cover. Place in the fridge to infuse for 2 days, stirring halfway through. Remove the solids with a fine mesh strainer and pour the liquid into a clean jar. 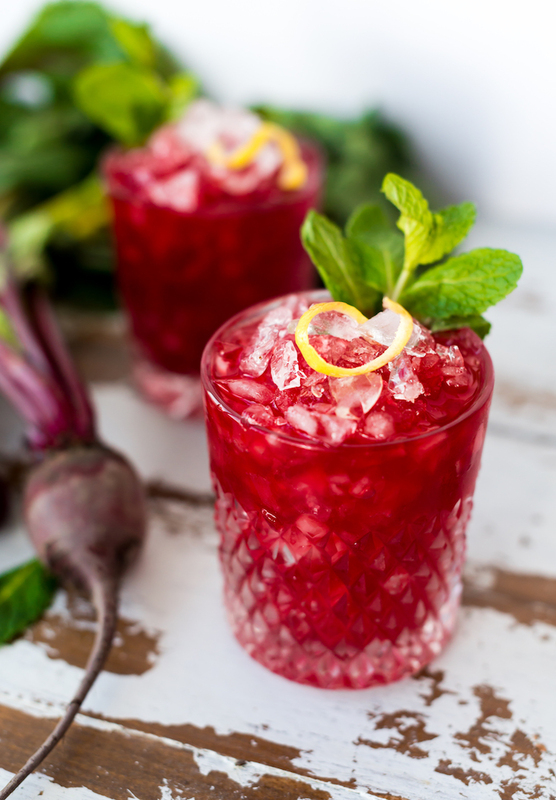 I was provided the cookbook + given permission to post the beet shrub cocktail recipe, but all opinions are my own! You’ve gotta love this recipe. 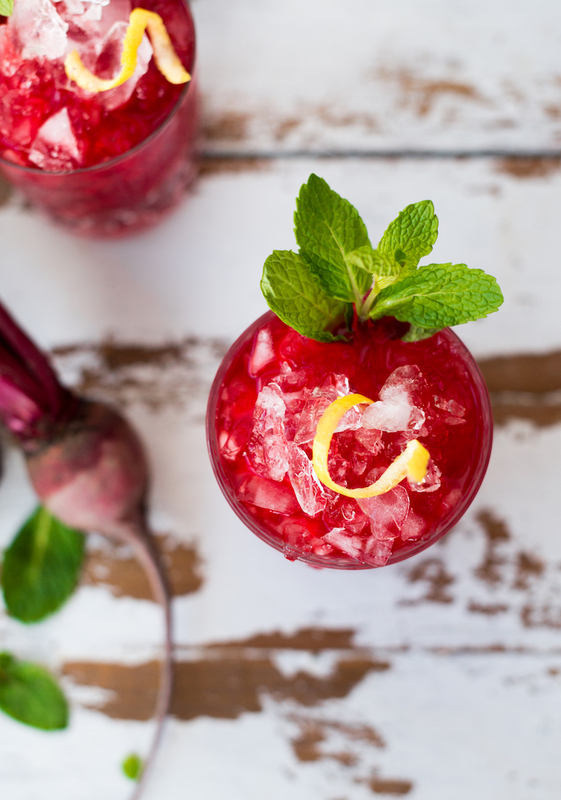 You are boozing it up while detoxing your liver. LOL! I love the bright and moody photos as well! <3 loving all these recipes! Thanks, Ally! This was a fun one to photograph, the color is just SO stunning, right?! Quick question: did you peel your beers before soaking them? Or did you just dice them up, skin on? I’m new to “cooking” with beets!